When you publish your website on Facebook and other social media, it displays with website title, description, and a thumbnail. In WebWave - website builder with no coding - thumbnail is generated automatically when you publish your website, but it can be easily changed to an image of your choice. In this article, you will learn how to build a website with a thumbnail of your choice. 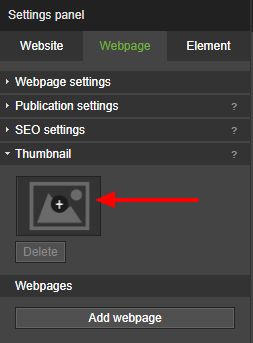 In Settings panel select "Newspage", "Thumbnail" and click on the "+". In the new window select an image which will be your website new thumbnail. Now, every time you share your website, it will be displayed with a new thumbnail. Each subpage can have a separate thumbnail. If a thumbnail of a home page hasn't been added, it will be automatically generated when you publish a website. If a thumbnail of a subpage hasn't been added, it will be automatically generated from a home page when you publish a website.